Want to buy a Track Bike? Try this facebook page. 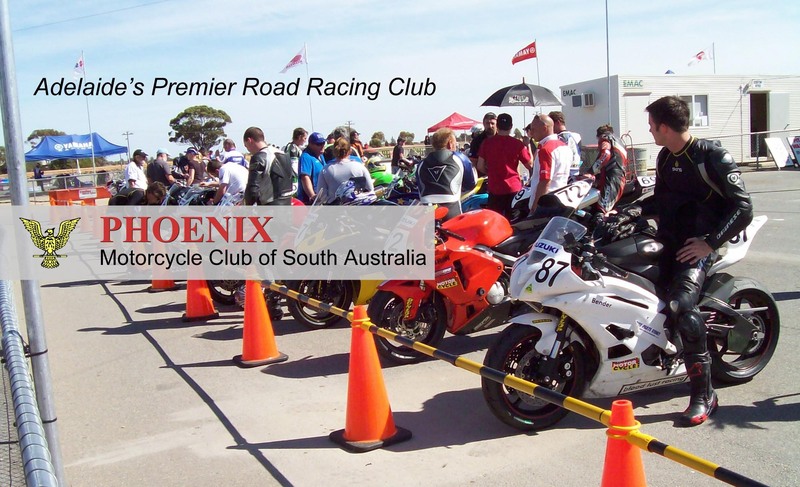 Want to prepare your bike for the track? Keep reading. The essential thing is safety, both for yourself and other riders, so ask questions and make sure your bike is ready before you get to the track. Most motorcycle shops will also assist you with race preparation. A back protector is not required for ride days but is necessary for racing. Bikes do not have to be prepared to the same standard as for racing, but are checked for safety before you can go on the track. The Scrutineer will look at the following items. No loose panels, bolts or clips. Bikes have to be prepared the same as for Class Racing. Tyres designed for highway use must have legal tread. Slicks or wet weather race tyres and warmers can be used. Front brake caliper bolts to be lock wired in the tightened position. Only water allowed in the cooling system. Bike centre and/or side stands should be removed. If not removed must be securely fixed in the up-position by secure mechanical means (e.g. hose clamp or bracket). Wiring, taping or plastic “zip” ties are not considered to be an adequate mechanical method of securing. Sump plugs, caps and filters which, if removed, permit the discharge of any lubricating, cooling or hydraulic fluids must be lock-wired. Where front fork drain plugs are recessed, taping is permitted to prevent loosening. Front brake reservoirs with screw cap closures must be taped to prevent loosening. Mirrors and indicators to be removed. Head and tail lights must be removed or completely taped to prevent light from being seen and to fully contain broken glass in case of accident damage. No gear racks, sacks or panniers. Number / registration plates to be removed. Rider Numbers to be placed on the front fairing, and both sides of the bike. A P plate is displayed at the rear of your bike as an indication to following riders that you are a novice. This plate and fittings is available from the Race Secretary at the event. Apart from slicks, tyres must have good tread, they can wear very quickly during a day on the track. Drain plugs and filler caps must be secured in the closed position. These include radiator caps, oil fillers, sump plugs, radiator drain plugs, fork drain plugs and oil filters. With spin on type filters, a hose clamp around the filter tied back to the frame or engine works well. Drains and fillers should ideally be drilled and wired in place. Alternatively they may be wired around, or cleaned and siliconed in place. Brake and clutch master cylinder caps also require secondary retention. Taping is normal practice, but use caution not to block any breather holes as it can cause the brakes to self apply when the fluid heats up. Drain hoses should be captured into a plastic bottle. Approved Race Numbers must be fitted (as specified in the Rules).